Being a first-time caregiver can be overwhelming. You want to make sure you ration out the right amount of medication, feed your loved one the best type of foods for their condition, and change wound dressings efficiently. Unless you’ve been formally trained in healthcare, it can be confusing. 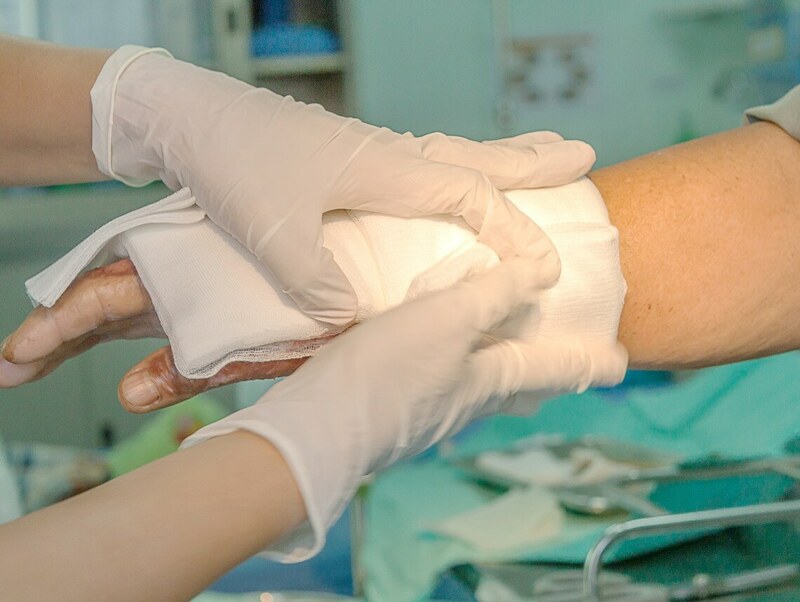 If you’re providing care for someone who needs a wound dressing changed regularly, it’s crucial to learn how to do so correctly to avoid infection. When changing wound dressings, what to expect will vary greatly depending on the type of injury. For a minor cut, it may just be a matter of taking off the old dressing and replacing it with a clean one. However, for major wounds, you may have to remove dead tissue or drain the wound. If you know you’ll be the one providing care for your loved one, ask the doctor for instructions on how to properly care for the specific wound in case you need to provide assistance beyond the basic change of a bandage. Step 1. Know where supplies are located. Keeping them in the same place will prevent you from scrambling at the last minute, trying to figure out where they are. If you’re rotating caregiving with someone else, make sure they also know where to find the supplies. Step 3. Wash your hands. Do so thoroughly for a full minute. Use warm water and soap, and dry completely before handling the wound dressing materials. Make sure to scrub all portions of your hands completely: the palms, the back, each finger, and in between each finger. Step 4. Put on sterile gloves. It doesn’t matter how clean you think your hands are after washing them, always wear sterile gloves when handling an open wound, cut, or burned skin. Step 5. Use saline water on the tape of the existing wound dressing. Do you remember how painful it could be to remove a bandaid when you were a child? You don’t want your loved one to go through that agony, especially if their wound is substantial in size or they have a severe wound underneath the gauze. Use drops of either water or saline solution around the tape on their skin to loosen the tape. Step 6. Inspect the wound. Once you remove the covering, check to see if there are any signs of infection, such as pus or a foul smell. If you notice any of them, note the issues and let the patient’s healthcare provider know. Step 7. Clean the wound. Wet a gauze with saline water and gently clean up any blood or other bodily fluids (a small amount of blood is ok. If it’s a substantial amount, the person needs medical attention). Once clean, let the wound fully air dry (placing new dressings while the wound is still wet fosters bacteria growth). Once dry, apply antibiotic ointment. Step 8. Place a new wound dressing. Apply antibiotic ointment to the wound, then apply a new non-stick pad to the wound and extra gauze if needed. Once covered, gently secure with wound tape. If you’re acting as a caregiver for a loved one, let us help you. At Sonas Home Health Care, we have an entire team of experienced caregivers who will ensure the wellbeing of your family member.